Gee, I wonder why it’s called Brick & Bell Cafe? If you like scones with your coffee, Brick & Bell Cafe is the perfect spot. They offer two sizes of scones (big and very big) and many varieties including chocolate chip, cranberry, blueberry, maple, and more. They served over 120,000 scones last year. So, after you have your coffee and scone, you may want to take one home for the next day. Their coffee is roasted by Kean Coffee of Newport Beach, specializing in organic and fair trade coffee. Be careful when you order coffee and know just how much you’d like since if you want more coffee, you’ll have to pay full price for a refill. No discount at all on the refill. You can have your coffee in a paper or “real” cup. I always opt for real cups . . . why hang out at a coffee shop and drink coffee from a paper cup?! 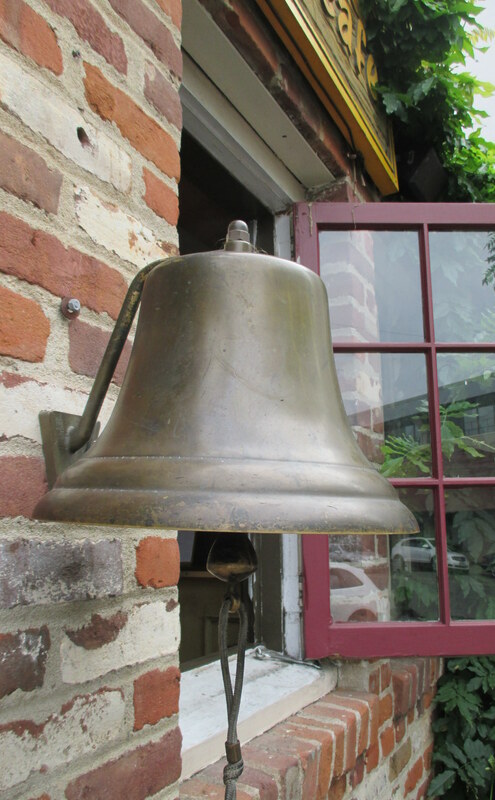 The cafe is housed in a red brick building with, of course, a bell. It’s a popular spot in the heart of La Jolla, right off Girard Ave. There’s indoor and outdoor seating, plus free wifi. Just around the corner from the cafe, Warwick’s independent book store (www.warwicks.com) hosts “Coffee with the Bookseller” on the second Tuesday of the month at 10:00AM. They serve Brick & Bell coffee and pastries, but be fast as the offerings disappear quickly or at least they did on my recent visit. That said, sipping on a cup of coffee and enjoying a scone while listening to someone talk about books makes any day a great one. Watch the signs for parking in the area as some streets are designated for one hour parking and other streets are for two hours of parking. The parking meter folks are vigilant so now you’re warned. This entry was posted in Coffee shops in San Diego, near the beach and tagged La Jolla, scones. Bookmark the permalink.